Make music with blocks — for charity. e have some reason to worry whenever entertainers organize for the needy — most memorably, rockers travel around the world in custom-order private airplanes to convene in massive arenas and lecture us about Western opulence through jumbotrons that you could pawn for Djibouti. OneBigGame, thankfully, doesn't do this. The nonprofit publisher is instead sending, to a pair of children's charities, the majority of proceeds from a musical, block-dropping puzzler called Chime. Big names nevertheless sell the title: "Place blocks against the clock and remix famous artists' music." One track each comes from the repertoires of Moby, Orbital's Phil Hartnoll, Lemon Jelly's Fred Deakin, trance DJ Markus Schultz, and minimalist composer Philip Glass. Philip Glass? This man works daily to narrow what interstice remains between academic and popular music. Not another Tetris knockoff: music responds to the placement of blocks.Two years after I played one of his pieces in a wind symphony, he found his way onto an Aphex Twin album. Sign me up. Just five songs; melodic and down-tempo, apropos for the game. From its product shot — and the first seconds of play — Chime looks like a Tetris knockoff. 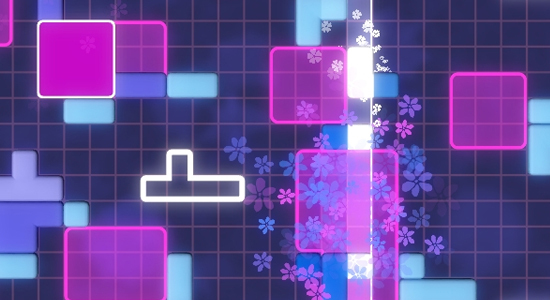 Players place random variants of block shapes onto a wide grid. The blocks can go anywhere they'll fit, and players may rotate each one ninety degrees this way and that before securing them and moving onto the next. Neither gravity nor time forces placement; a player could hold onto a block for nine minutes if he wanted to, but Chime's incentives say he wouldn't. The "beatline," a highlighted, vertical cross-section, passes left to right in time with the music. It triggers prerecorded accents and flourishes when passing over blocks. When it passes over a three-by-three area on the grid or larger filled by blocks, the area — a "quad" — gains an outline and begins to fill with a solid color. In those few seconds, more blocks may be added along the edges to expand the rectilinear frame. When the beatline passes the quad again, a pronounced musical phrase — vocal samples, sforzando stings or runs — plays, and the larger the quad, the more sensational. Minimalist, meet minimalism: a shame there are only five songs.One more pass, and a quad vector fades completely, its now-tinted grid area open to new blocks. It shouldn't take long for one to realize that advancing in levels by creating quads and increasing coverage of the board amounts to an electronic music performance. Littering blocks across the grid ornaments the song, manifesting a crescendo. Moving faster than the beatline and dropping blocks to build concurrent quads at opposite ends of the board creates antiphony, the resulting call-answer ethereal or saucy or marcato, depending on the artist. A shame, then, that there really are just five songs. Chime's expense hardly suggests a lot of content — and the roster is, dollar for dollar, a bargain — but the game is such fun that limited presentation disappoints. For now; as proof of concept, it heralds a full release. What about Glass' minimalist fellow, Steve Reich? Ambient project Solar Quest? German electro-shoegazer Ulrich Schnauss? Yes, licensing is complicated. But take one look at the plastic guitar trend: bands line up for it. All the more money to charity. I can't recommend this game enough, especially for the price and its fund-raising nature. It would be so easy to release DLC for this game, I hope they're at least considering it. Even with the additional production necessary for tracks, the model is probably very easily scalable — even beyond Xbox Live. An iPhone app, perhaps? The musical creation brought many more "Wow, this is cool" moments than other titles. Chime has such unique spacial and auditory interaction.